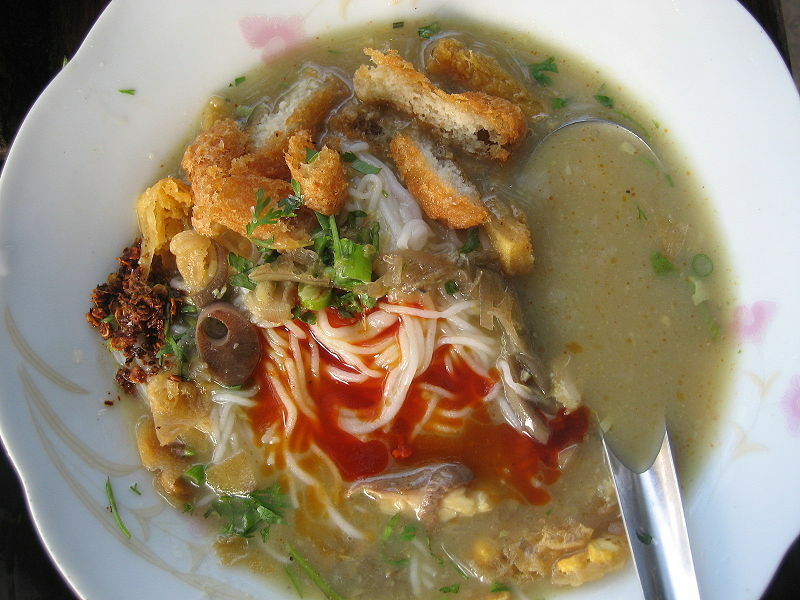 Mohinga is rice vermicelli in fish soup and considered by many to be the national dish of Myanmar, formerly Burma. It is readily available in most parts of the country. In major cities, street hawkers and roadside stalls sell dozens of dishes of mohinga to the locals and passers-by. Its ingredients depend on their availability. However, the standard dish comes from southern Burma, where fresh fish is more readily available. The main ingredients of mohinga are chickpea flour and/or crushed toasted rice, garlic, onions, lemongrass, banana tree stem, ginger, fish paste, fish sauce and catfish in a rich broth cooked and kept on the boil in a cauldron. It is served with rice vermicelli, dressed and garnished with fish sauce, a squeeze of lime, crispfried onions, coriander, spring onions, crushed dried chilli and, as optional extras, crispy fried fritters such as split chickpeas, urad dal (a bean grown in southern Asia) or gourd as well as boiled egg and fried fish cake. It is perhaps the most popular breakfast dish of all, now available as an "all-day breakfast" in many towns and cities. Mohinga is also served with all the trimmings at formal functions and nowadays it is also sold in dry packets as a ready-made powder that is used for making the broth. Left: Mohinga streethawker. On one side is the soup in a large pot, with lid and ladle, kept hot on a stove; the other carries rice vermicelli on banana leaves and covered with white muslin in a bamboo basket, with all the trimmings in pots, jars and bottles, including fritters kept crispy in a bag on the top shelf along with bowls and spoons. Street hawkers are the original purveyors of this popular dish doing the rounds through neighbourhoods where they have regular customers. 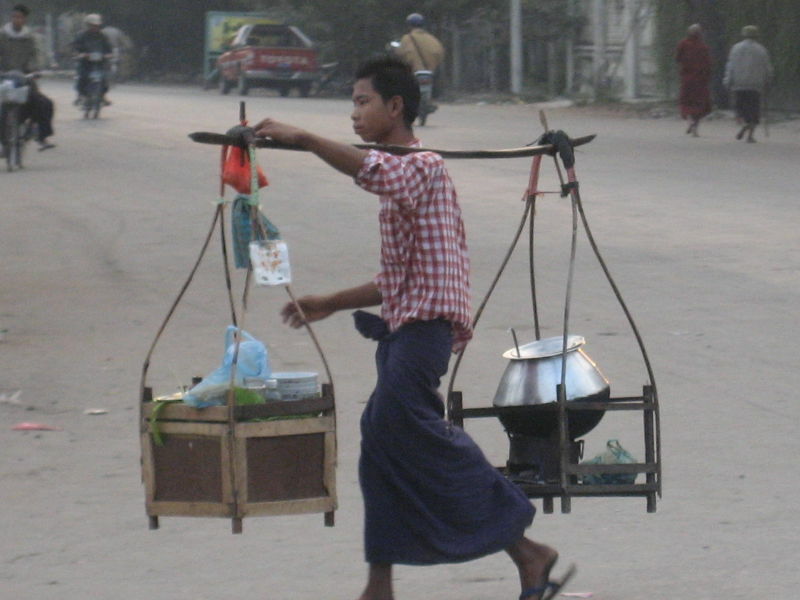 They carry the soup cauldron on a stove on one side of a shoulder pole and rice vermicelli and other ingredients along with bowls and spoons on the other.